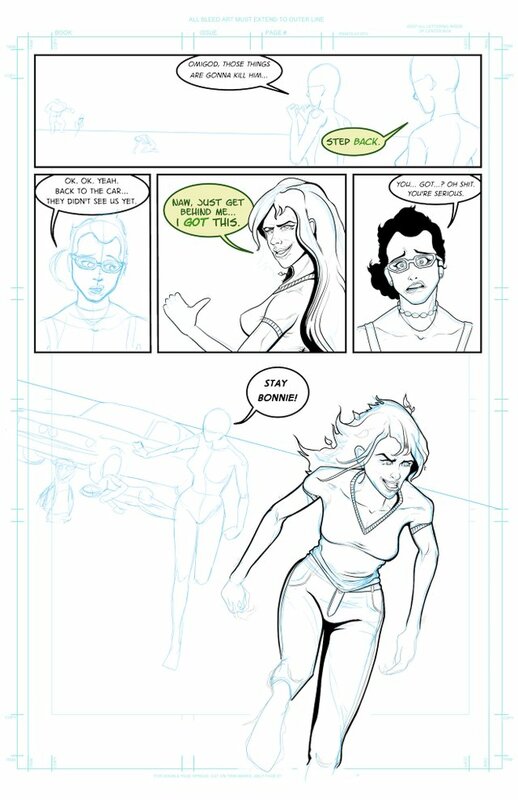 "I Thought It Would Be Zombies..." Comic Crowdfunding Update #7; Charging Ahead!steemCreated with Sketch. Hard to believe... but yet another week has gone by, so it's past time to once more post an "I Thought It Would Be Zombies..." Comic Crowdfunding Update! This marks the 7th update in the series and the progress on the Fundition campaign is so far outpacing the speed of my comic production, which is motivating me to push myself harder! For those just joining this series "in progress..." here's a standard summary spiel I've put together. You loyalists and veterans feel free to skim ahead! “I Thought It Would Be Zombies…” is an independent comic book created and in production by yours truly, Bryan “the Imp” Imhoff. It follows a ragtag band of survivors through the aftermath of a “magical apocalypse,” both humorous and horrific; beautiful and terrifying. Fundition is the first dedicated crowdfunding platform built on the Steem blockchain. Supporters can back projects with direct contributions of cryptocurrency, or by simply “liking” the posted content! On the Steem blockchain, your votes have value, and Fundition is designed to tally this value over the course of an extended campaign. A look at my drafting table tonight reveals me plugging away at page #17. And no, I'm not working entirely in order. I wish I had 16 pages done already! If you takeaway one thing from this update post, it'll be that I skip around a lot! Damn creative ADD. 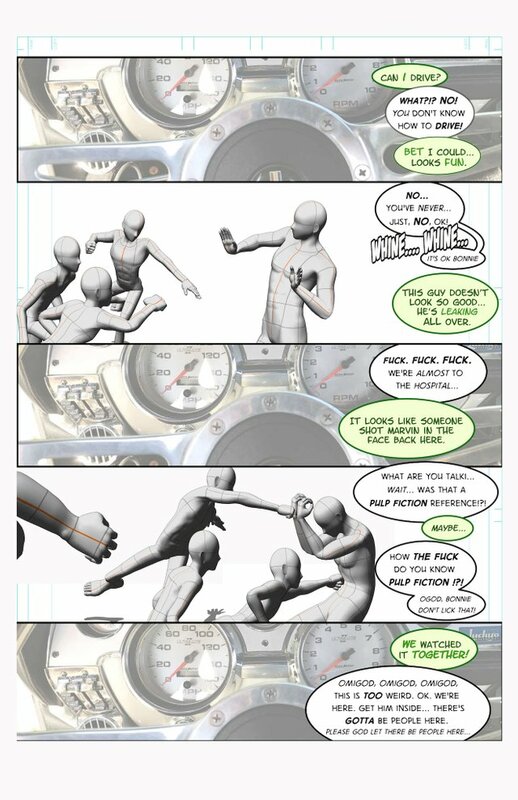 I do almost all my work in the Clip Studio software on an iPad Pro, or on my desktop Mac mini for the lettering and some of the initial 3D model layouts. At hand I have some of the character "model sheets" as I do my best to keep the characters looking consistent and "on model" although it is a struggle for me. I also printed off a test sheet to see how things were shaping up at printed sizes. It's very easy to get lost in zooming in digitally, and it's tough to know exactly how the digital file might translate to the printed page. It's no use spending hours drawing the thinnest, most precise ink lines if they don't even show up when printed! I'm happy with seeing the quick printout as the ink lines look sharp and clean, and it gave me an idea that some of my preliminary lettering is too large and with too thick "balloon lines." I'll be adjusting these elements in the future. I like to work back and forth in this way as I fit the "puzzle pieces" together. It's important to know if all your dialogue will fit, how it will interact with and obscure the art, and so on. 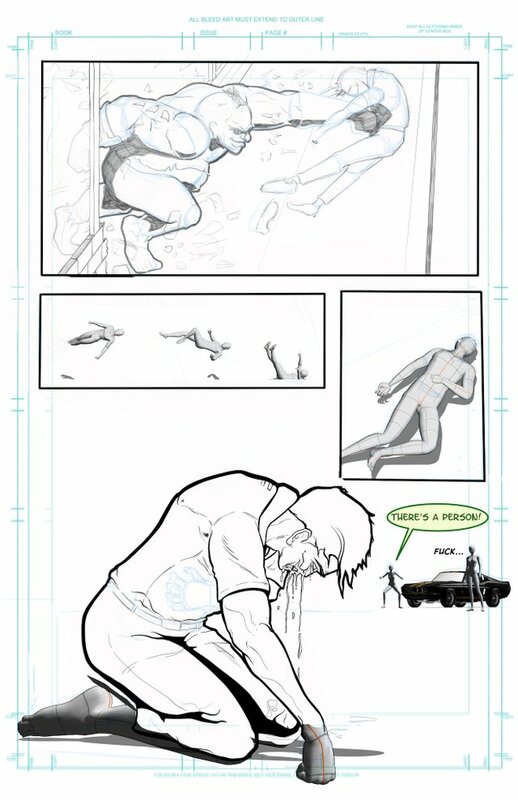 At this stage if you look at page #17, I have a little over 8 hours of work into it, with many more to come! But it's starting to shape up, as is the entire comic in general! For your enjoyment and entertainment (hopefully), I've output quick previews of this particular sequence to date, pages # 15-18. They are still all at very early stages ranging from just 3D layouts, to the "blue line" sketch stages, pencils, or inks in certain areas. If you haven't seen looks at these pages in past posts, I hope it gives a bit of insight into the pacing, planning, and developing character personalities. This sequence features the very first appearance of main characters Sarah, Julie, and Bonnie; as they stumble upon Dave, who has already gotten himself in a bit of trouble in the first half of the issue! Rather than work through the pencil and ink stages on all pages before moving on to the finishing touches of colors and lettering, I've got it in mind to get this sequence almost completely finished first... so that I have a segment of story in finished form to show around, post online, and use for marketing and generally exciting more people about the project ahead! So there you have a bit of creative progress, let's take a quick look at the funding that'll get "I Thought It Would Be Zombies..." printed and in people's hands when I'm finally finished! The “I Thought It Would Be Zombies…” Fundition Campaign officially started on August 14th, 2018 so at this point it has been running for just over 5 weeks and featured 7 total posts in the series. To date the campaign has raised 250.242 Steem through a combination of up votes and direct donations. At the time of this writing, that is equivalent to about $225 USD. That puts "I Thought It Would Be Zombies..." at over 4% of the basic fundraising goal, and as enthusiastic as I am about future price increases in the value of Steem, in my head I see that as much more before the campaign comes to a close. All of the Steem acquired I am holding as Steem Power until the campaign finishes and I need to cash it out to pay for printing and other expenses. So everyone donating and voting can see their reward levels rise along with the value of Steem! To date, 5 individuals have achieved the "B-Class"Flare tier of rewards, which entitles them to a printed copy of the comic on release, and many more folks are working toward free digital and printed copies with their steady contribution of upvotes on the update posts like this one! You can always check your own status of accrued voting contribution by visiting the official Fundition Campaign Page. However, you can vote on update posts through any Steem based interface and still receive credit for your support. Whew, hope you stuck with me through all that and had a fun time with the update! It's back to the drafting table for me... but not for long, as my bed is beckoning with equal insistence! Take care everyone, and as always a heartfelt thanks for all your well wishes and support as I work on "I Thought It Would Be Zombies...!" Wow. It looks pretty awesome! I also think that it's important to get you're story straight and then you're art. Though you're art looks pretty amazing. ...is this an ipad app you use for creating this 3D layouts? Yep! The 3D is all done within Clip Studio Paint. It’s available on desktop & iPad, and the iPad app is pretty much a direct port. So I work back & forth between the two. 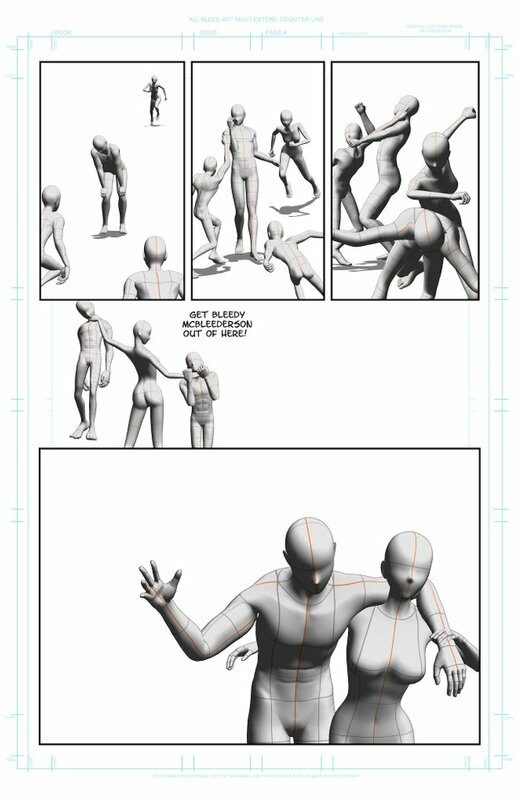 I find it easier to do the 3D layouts on desktop, but you can do it fully on iPad and continue to adjust & manipulate it there while doing the drawing work. Fundition really has immense potential. A growing user base will really bring it to another level. Right now much of the support is derived from the Fundition Fund itself, for which I am incredibly grateful. 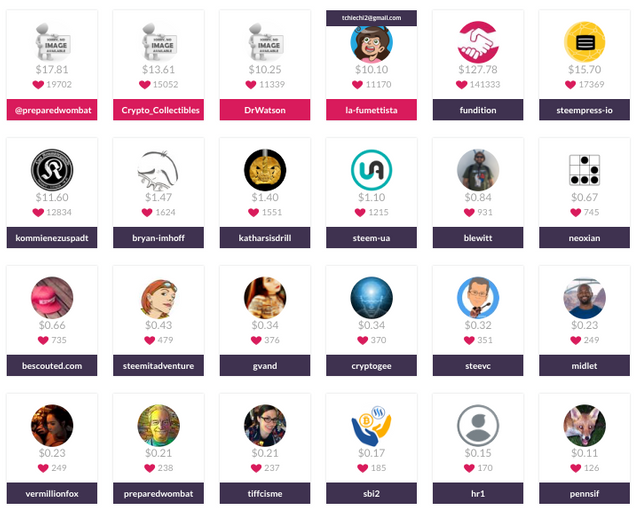 But I’ve also been amazingly humbled by the votes and donations I’ve already received from the Steem community. I’m still in shock folks are sending Steem to support the comic! It has created a positive pressure on me to progress faster and bring this story to publication, so I can fulfill on the promises of the campaign. Looks like these pages are really coming along! Awesome! I get so excited every time I see one of these updates. Haha I feel like I’m living vicariously, a little bit, and also drawing some great inspiration and motivation. I’ve just been gifted a new iPad and Apple Pencil, so upon reading this, I instantly went and downloaded the clip studio app. Can’t wait to play around with it! I saw your post about the new iPad and I’m so excited for you! And I’m so happy you find these updates fun & inspirational. That’s so motivational and gratifying to me! Honestly, Procreate and Clip Studio are both great and each have their strengths. Procreate probably has the edge for straight illustrations, digital painting, & such... but Clip is really geared toward comics, so it’s well worth exploring and seeing which you prefer for the comic you have brewing. I like reading your comic creation, please continue :D.
Honestly, it usually works out pretty well. I’ve blocked out how many pages I think each scene will take, and just by reading & studying a lot of comics and thinking about how I want to pace a sequence, I’m usually pretty accurate. I’m also interspersing some mock advertisements, so those can be cut or added as the story pages might demand. Thanks for the support! I shall continue! Your UA account score is currently 4.740 which ranks you at #1398 across all Steem accounts. In our last Algorithmic Curation Round, consisting of 298 contributions, your post is ranked at #60.